Introduction: Oral health is an important aspect of health for all children and is all the more important for children with special needs. Aim: To evaluate the oral health status of special health need children at Vidya Sudha, a day care centre in Chennai. Materials and Method: A modified WHO oral health assessment form was used to assess the caries experience, gingival, and oral hygiene status. Result: Data were analyzed using ANOVA and chi-square test. No statistical significant differences were found between the evaluated groups regarding age or gender, and medical conditions. Conclusion: Majority of the children had poor oral hygiene, showing high caries prevalence as well as moderate gingivitis. The prevention and treatment of the early stages of dental disease lie in the provision of self-care but this may be difficult for the SHCN children. In India, there is little data available relating to dental health in SHCN children and hence this study was done to assess the oral health status in those children. The study population consisted of children attending Vidya Sudha, a private day centre for children with SCHN. At the time of this study, there were seventy children attending Vidya Sudha. Consent forms were also sent to parents to indicate their children's or wards participation in the screening exercise. Only subjects whose parents consented to their ward's participation and were present in school at that time were examined. The screening for each subject included a record of the child's bio-data, type of disability, and parent's educational background, as provided by the parent or from the school record [Table 1]. Oral examination was carried out on all the children in the dental clinic of the school. The oral health status of all the children were recorded using a modified WHO oral assessment form (1997). Mouth mirror and explorer were used to evaluate the presence of decay, missing, and filled teeth. The oral cavities of children were examined for oral lesions and caries exposure was recorded using the dft, DMFT indices. Gingival status was recorded using gingival index given by Silness and Loe. The oral hygiene status of the children were assessed according to criteria used in the simplified oral hygiene index (OHI-S) proposed by Green and Vermillion. The children were examined in the dental chair under light illumination using a sterile mouth mirror and CPITN probe, while taking protective cross infection control measures using disposable gloves and masks. Each examination was conducted by the same examiner. After evaluation of SHCN children, data were reported and statically analyzed using ANOVA and Chi-square test. No statistically significant differences were found between the evaluated groups regarding age or gender, and the medical conditions. Out of 21 delayed development children 13 (61.9 %) were having dft with a mean dft indices. 22±0.14, 14 (66.7%) were had gingivitis and three were having poor oral hygiene. Out of 20 autistic children seven (35%) had dft with a mean dft index. 18± 0.16, 13 (65%) had gingivitis, and four (20%) had poor oral hygiene. Out of ten cerebral palsy five (50%) had dft with mean dft 0.18±0.16, two (20%) had gingivitis and two (20%) had poor oral hygiene. Out of five Down's syndrome three (60%) had dft with mean dft 0.41±33, two (40%) having gingivitis, two (40%) had poor oral hygiene. Out of five delayed speech language three (60%) had dft with mean dft index 0.13±0.02, 1 (20%) having gingivitis and 1 (20%) had poor oral hygiene. 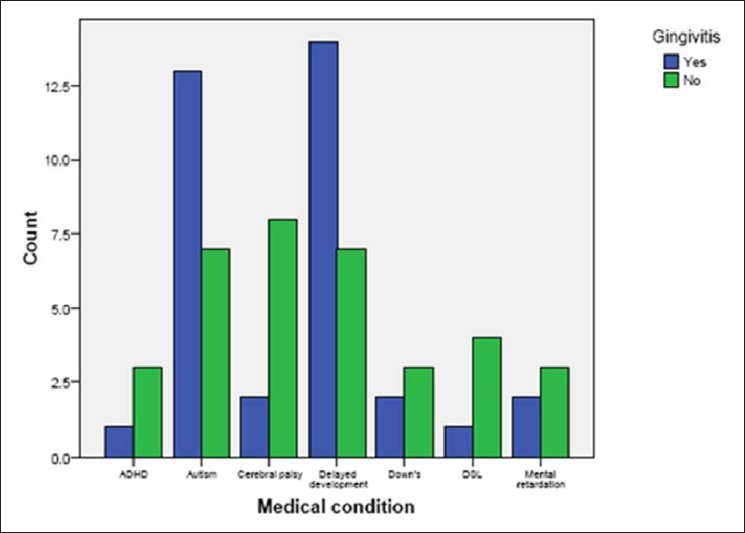 Out of five mental retardation cases, one (20%) had dft with mean dft index. Out of three, two (40%) had gingivitis and one (20%) had poor oral hygiene. 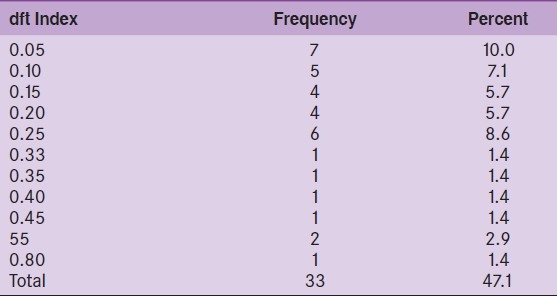 Out of four ADHD, one (25%) had dft with mean dft index 0.05, one (25%) had gingivitis, and one (25%) had poor oral hygiene [Table 2], [Figure 1] and [Figure 2]. Swallow demonstrated a trend of lower caries incidence in the primary teeth of children with a wide range of physical and medical handicaps. While Miller and Taylor showed somewhat greater caries incidence in the permanent teeth of orthopedically handicapped children. , In short, it was found that the dental caries rate was generally higher in handicapped children than nonhandicapped children. Its prevalence was highest in mentally retarded children, followed by those with cerebral palsy, those who were blind, with epilepsy, physically handicapped children with Down syndrome, and the hearing impaired. ,, In this study, dft index was highest in delayed development children, followed by Down syndrome and delayed speech and language children, cerebral palsy, autism, attention deficit hyperactivity disorder, and those with mental retardation that is par with the previous studies. The type of handicapped condition had a significant effect on the gingival problems observed; children with mental retardation had the poorest levels of oral hygiene and the greatest periodontal treatment requirement. Various investigators have reported poor oral hygiene in handicapped children. Prolonged retention of food particles in the oral cavity might result in a higher incidence of dental caries and gingival inflammation. The most obvious reason for poor oral hygiene in an orthopedically handicapped child is a physical inability to clean the oral cavity adequately. Another reason is a lack of self-discipline because of overprotective parents. ,,,, In this study gingivitis was found to be high in delayed development children (66.7%), followed by autistic child (65%), Down syndrome (40%), and mental retardation (40%), (25%) attention deficit hyperactivity disorder (ADHD) and delayed speech and language (20%). Most of the children were proven to have a poor oral hygiene. There was an overall increase in the prevalence of dental caries among most of the children. The prevalence of gingivitis was found out to be moderate [Table 3]. Promote training of personal dental care. In severe cases, the parents should be counseled regarding the importance in maintaining their children oral health. Implementation of complete preventive procedures by trained pediatric dentists, for improving and maintaining the oral hygiene of children with special needs. 1. Oredugba FA, Akindayomi Y. Oral health status and treatment needs of children and young adults attending a day centre for individuals with special health care needs. BMC Oral Health 2008;8:30. 2. Frassica JJ, Miller EC. Anesthesia management in pediatric and special needs patient undergoing dental and oral surgery. Int Anaesthiol Clin 1989;27:109. 3. Green JC, Vermillion JR. The simplified oral hygiene index. J Am Dent Assoc 1964;68;7-13. 4. Swallow JN. The dental care for cerebral palsied child. Cerebral Palsy Bulletin 1961;3:488-92. 5. Swallow JN. Dental disease in handicapped children. An epidemiological study. J Dent Med 1972;21:41-51. 6. Greeley CB, Goldstein PA, Forrester DJ. Oral manifestations in a group of blind students. J Dent Child 1976;43:39-41. 7. Gupta DP, Chowdary R, Sarkar S. Prevalence of dental caries in handicapped children of Calcutta. J Indian Soc Pedod Prev Dent 1993;1:23-7. 8. Johnson CD. Preventing facititious gingival injury in an autistic patient. J Am Dent Assoc 1996;127:244-7. 9. Reid BC, Chennette R, Macek MD. Prevalence and predictors of untreated caries and oral pain among Special Olympics athletes. Spec Care Dentist 2003;23:139-42. 10. Seymour RA, Thomason JM, Ellis JS. The pathogenesis of drug induced gingival over-growth. J Clin Periodontol 1996;23:165-75. 11. Tesini DA. Age, degree of mental retardation, institutionalization and socio-economic status as determinants in the oral hygiene status of mentally retarded individuals. Community Dent Oral Epidemiol 1980;8:355-9. 12. Bonito AJ. Executive Summary: Dental Care Considerations for vulnerable populations. Spec care Dentist 2002;22:5-10. 13. Nam-ki Choi, Kyu-ho Yang. A Study on the Dental Disease of the Handicapped. J Dent Child 2003;70:2. 14. 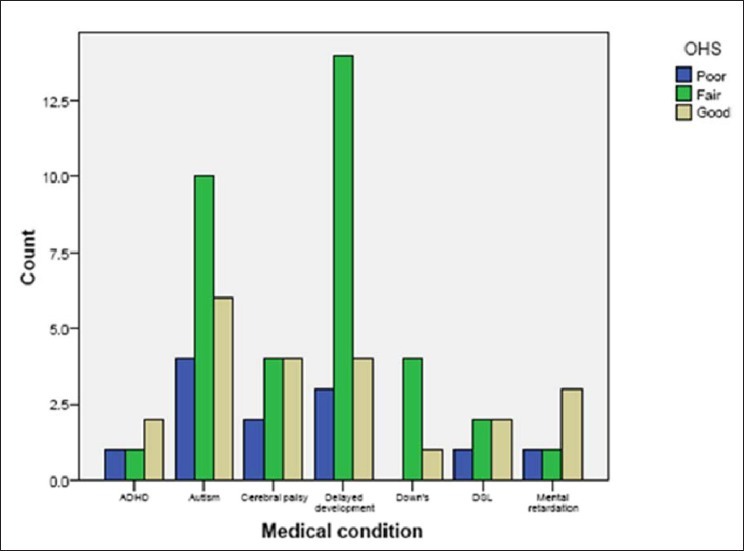 Brown JP, Schodel DR. A review of controlled surveys of dental disease in handicapped persons. J Dent Child 1976;43:313. 15. Declerck D, Vinckier F, Gizani S, Martens L, Marks L, Goffin G. Status of the teeth and degree of care in handicapped in Flanders. Rev Belge Med Dent 1995;3:9-24. 16. Lyons DC. An evaluation of the effects of cerebral palsy on dentofacial development, especially occlusion of teeth. J Pediatr 1956;49:432-6. 17. Lyons DC. The dental health of a group of handicapped adolescent children. J Periodontol 1960;31:52-5. 18. Miller JB, Taylor PP. A survey of oral health of orthopedically handicapped children. J Dent Child 1970;37:331-2. 19. National Maternal and Child Oral Health Resource Center Oral Health Services for children and adolescents with special health care needs: Resource Guide Washington DC 2005.